This book will always hold a special place in my heart because it was the first book I ever recipe tested for. I can’t even remember know how it came about – I think I’d asked a question about veggie burgers on the PPK and at around the same time commented on something I’d tried on Joni’s blog, and she asked me if I’d be interested. At that time Joni was planning to self publish the book as a follow up to her earlier book Cozy Inside. Halfway through testing that changed and she got the offer to work on 500 Vegan Recipes with Celine, and then their next book. Around that time her new publisher was interested in the burger book, so she started working on it again. That’s just a bit of history in case you’ve been reading this blog a long time and wondered how come it took so long for the book to get published! We got into the habit during testing of trying a new burger every Friday night and we’ll still more often than not have some kind of burger on a Friday. So it was with great excitement that I received my tester copy, some 4 years later than my first test. I was so pleased with how it turned out! I feel like that about books I tested a lot for; they almost feel like my babies as well and I want them to look as good as they can. This book has beautiful pictures taken by Celine and there are plenty of them. 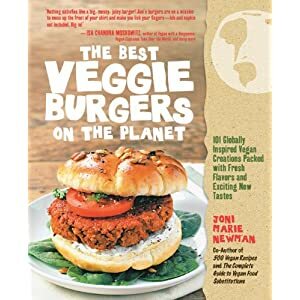 The chapters are mostly geographically influenced but there are also chapters devoted to breakfast, holidays, buns, sides, sandwiches and desserts – there really are burgers for every occasion. I’ve tried too many of them to discuss at length, but I’ve made 3 since I got the book that I hadn’t tested. The best part of the book is the variety. There are plenty of traditional meaty burgers that you can serve in a bun with all the fixings, but also there are vegetable based burgers, grain and bean based burgers and some burgers full of surprise ingredients like sauerkraut, buckwheat or potatoes. Some of them are best fried, some baked and some even go on the grill. There are soy and gluten free burgers too, so there really is a burger for everyone here! 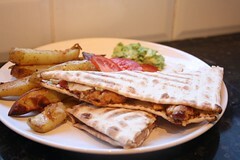 Pinto rice burger, made thin and quesadilla style with Redwood pepperjack cheese. 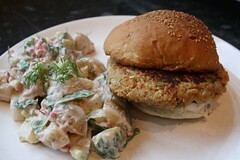 Jalapeno cheddar burger, with smoky potato salad, also from the book. Other favourites have been the Sunday afternoon grillers, the stuffed burgers, BLT burgers, Cinco de Mayo burgers, Noodle Kugel burger and the Noochy burger. I adore both of the macaroni salads too. If you’ve got this book, I’d love to hear what you’ve made, and if you haven’t, I’d love to know what’s stopping you! I have that book and made the meatloaf burger. It was good. I’m looking forward to making many more burgers out of it this summer. I’m considering getting the word trifecta tattooed across my chest because I love them that much. We’ve been making burgers since the book arrived to varying results. 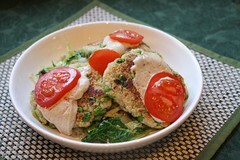 I loved the Meatloaf Burgers but the Hippy Burgers and the Falafel Burgers both just tasted floury and the Falafel Burgers were a nightmare to make, I have never ever encountered anything as sticky as that mix! I will try them again and add a lot more spice and herbs to both to see if I can get some flavour in them as the texture wasn’t bad, but I was a bit disappointed with them. Won’t stop me trying more though, I think I’ve just been unlucky so far! I haven’t tried either of those ones yet. The ones with avocado in the middle are AMAZING. These look really nice, but I’m actually not much of a burger fan (shock-horror!). Maybe I should get the book anyway I’m sure I’ll get into them by the time BBQ season comes round. Actually I think I just have a small obsession with cookbooks! This one is on my future “to buy” list. I’ve been very intrigued. I’ve had my eye on that book for a while now…..I may just have to get it!! I made the Bacon Cheeseburgers yesterday for my 4th of July weekend BBQ (day 1). OMG! These are absolutely great burgers. I made the bacon bits on page 185 and then the burgers on page 89. I cooked them on the Weber grill, smothering them with BBQ sauce a couple of minutes before I took them off of the grill. These may be the best vegan burgers I’ve made to date. VERY tasty! I made a double batch and froze 7 burgers. I am taking half to a family BBQ later this month. These held up on the grill exceptionally well and I just had a leftover burger, which was as good today as the burger was yesterday.